SO GREAT A CLOUD OF WITNESSES is a moving portrayal of the Shower of Stoles Project and their stories. This half-hour documentary tells how the Project began and the impact it has had since its founding in 1996. 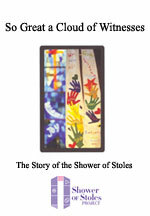 Through interviews with Martha Juillerat, Tammy Lindahl, and others, and with stunning footage of the stoles themselves, this DVD brings to life stories of GLBT persons of faith who have been barred from openly serving the church. Created to be used with exhibits of the stoles, in adult and high school education programs, and to foster group discussion. Study guide and discussion questions included. See pictures from the World Premier in Minneapolis. 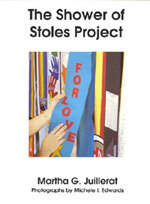 Full color, 14 pages, contains a brief history of the stoles, plus photos and stories of a number of the stoles. Makers of creative and finely crafted liturgical vestments, seeking to support the ministries of affirming faith communities. Global Connections is a place to purchase inexpensive stoles for the Shower of Stoles Project from a fair trade company serving cottage industries in developing countries. SERRV has stoles for under $40, and all the proceeds from SERRV are returned directly to the Third World crafts persons that make these stoles. You can reach SERRV at 1-800-422-5915, or at the Greater Gift web site.